Nuclear fusion is the energy source of the future. It promises to be a safe, clean and supply virtually limitless energy source. Despite being a ‘nuclear energy source’ it has none of the associated problems that accompany the current Nuclear Fission reactors. Nuclear fusion is the energy-producing process that takes place continuously in the Sun and other stars. Mankind has been able to re-produce fusion on earth but only in nuclear bombs. Scientists have not yet been able to control the reaction so that we can obtain useful energy from it. Despite the fact that nobody has put the technology into practice yet, working reactors aren’t actually that far off. Fusion reactors are now in experimental stages at several laboratories in the United States and around the world. Fusion is what happens when two atomic nuclei are forced together by high pressure … high enough to overcome the strong repulsive forces of the respective protons in the nuclei. When the nuclei fuse, they form a new element, and release excess energy in the form of a fast-moving neutron. The energy is ‘extra’ because the mass of the newly formed nucleus is less than the sum of the masses of the original two nuclei; the extra mass is converted to energy according to Einstein’s equation E=mc2. For example if two of the isotopes of hydrogen, called deuterium and tritium are forced together they form a new element, helium. A neutron is released along with an amount of energy. (Hydrogen isotopes are just hydrogen atoms with one or two extra neutrons in each nucleus). It is this released energy that needs to be harnessed to provide power to do some useful work. W­hen hydrogen atoms fuse, the nuclei must come together. However, the protons in each nucleus will tend to repel each other because they have the same charge (positive). High temperature - The high temperature gives the hydrogen atoms enough energy to overcome the electrical repulsion between the protons. High pressure – Pressure squeezes the hydrogen atoms together. They must be within 1×10-15 meters of each other to fuse. We must squeeze hydrogen atoms together by using intense magnetic fields, powerful lasers or ion beams. The first generation fusion reactors will likely use deuterium and tritium for fuel because they will fuse at a lower temperature. Deuterium can be easily extracted from seawater, where 1 in 6500 hydrogen atoms is deuterium. Tritium can be bred from lithium, which is abundant in the earth’s crust. 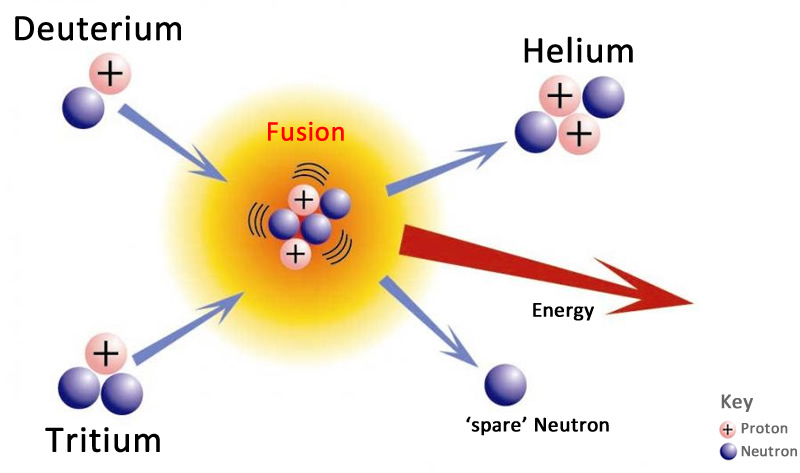 In the fusion reaction a deuterium and tritium atom combine together, or fuse, to form an atom of helium and an energetic neutron. It only takes a small amount of these isotopes to produce a lot of energy! The deuterium-tritium fusion reaction results in an energy gain of about 450:1!! No other energy source we can tap releases so much energy for the amount that is input. In the Deuterium-Tritium reaction both the extra neutron and the new helium nucleus (called an alpha particle) carry off excess energy which can be used, to heat water for example, and generate electricity. Ultimately though, deuterium-deuterium fusion would be better because it is easier to extract deuterium from seawater than to make tritium from lithium. Also, deuterium is not radioactive, and deuterium-deuterium reactions will yield more energy. 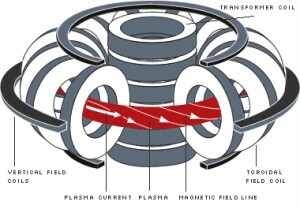 In order for fusion reactions to occur, the particles must be hot enough and in sufficient number (density) and well contained (confinement time). There are two different ways that we might achieve ‘controlled’ fusion, that are currently being explored in laboratories around the world. Magnetic confinement uses magnetic and electric fields to heat and squeeze the hydrogen plasma long enough for fusion to begin. In November 1997, researchers exploiting the magnetic confinement approach created a fusion reaction that produced 65 percent as much energy as was fed into it to initiate the reaction. Magnetic confinement method for producing fusion is regarded by some scientists as the most promising one for future commercial energy production. There are many of these types of reactors currently in operation around the world, and more are planned for the future. But so far, none have been able to sustain the reaction for more than a few seconds as the plasma leaks out. Improved magnet design and higher input power will perhaps allow these reactors in the future to maintain a fusion reaction indefinitely, producing copious amounts of power from seawater. Inertial confinement uses laser beams or ion beams to squeeze and heat the hydrogen plasma. 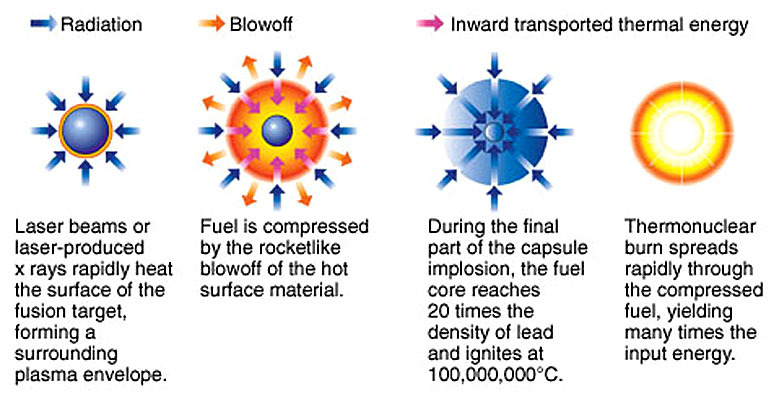 Inertial confinement makes use of intense laser or electron beams to implode a fuel pellet. 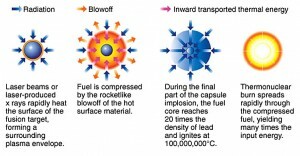 The pellet of deuterium/tritium fuel – a peppercorn-size fuel pellet – must be bombarded by two million joules, delivered in 4 nanoseconds. This is a power demand of 500 terawatts, and the equivalent of condensing up to ten hours’ worth of electricity used by half a dozen homes into a fraction of a second! Lasers can do this. Here’s how it should work. Many pulsed laser beams hit the fuel pellet simultaneously, causing the surface of the pellet to become a very hot plasma. This plasma expands inward, compressing the remaining deuterium and tritium so much that its temperature rises to the required 100,000,000 degrees. For about one tenth of a billionth of a second, there are the same conditions inside the pellet as those inside a star and fusion takes place. However present laser technology is too expensive to go further, for now. 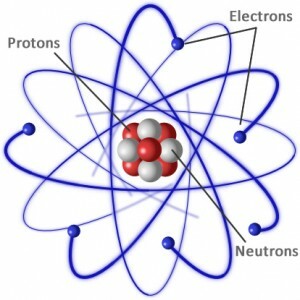 An atom is made up of several different sub-atomic particles. It basically consists of negatively charged electrons orbiting around a nucleus. The nucleus itself consists of positively charged particles called protons and particles with no charge at all called neutrons. The number of negatively charged electrons match the number of positively charged protons in the nucleus so that the whole atom is neutral with regard to charge. Different substances have differing amounts of protons (and neutrons) and corresponding electrons, it’s what makes the properties of elements such as Carbon with 6 protons so different to say Gold with 79 protons. There are also different isotopes of elements which are elements with differing amounts of neutrons but the same number of protons. The orbiting electrons cannot choose any orbit they wish. They are restricted to orbits with only certain energies. Electrons can jump from one energy level to another, but they can never have orbits with energies other than the allowed energy levels. Let’s look at the simplest atom, a neutral hydrogen atom. Its energy levels are given in the diagram below. 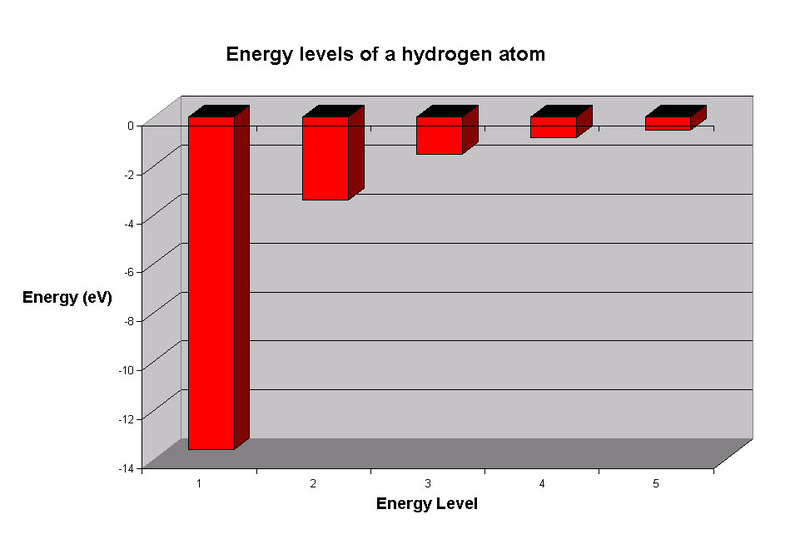 The x-axis shows the allowed energy levels of electrons in a hydrogen atom, numbered from 1 to 5. The y-axis shows each level’s energy in electron volts (eV). One electron volt is the energy that an electron gains when it travels through a potential difference of one volt (1 eV = 1.6 x 10-19 Joules). Electrons in a hydrogen atom must be in one of the allowed energy levels. If an electron is in the first energy level, it must have exactly -13.6 eV of energy. If it is in the second energy level, it must have -3.4 eV of energy. An electron in a hydrogen atom cannot have -9 eV, -8 eV or any other value in between. Let’s say the electron wants to jump from the first energy level, n = 1, to the second energy level n = 2. The second energy level has higher energy than the first, so to move from n = 1 to n = 2, the electron needs to gain energy. It needs to gain (-3.4) – (-13.6) = 10.2 eV of energy to make it up to the second energy level. The electron can gain the energy it needs by absorbing light. If the electron jumps from the second energy level down to the first energy level, it must give off some energy by emitting light. The atom absorbs or emits light in discrete packets called photons, and each photon has a definite energy. Only a photon with an energy of exactly 10.2 eV can be absorbed or emitted when the electron jumps between the n = 1 and n = 2 energy levels. How does an Atomic Clock Work ?